Although our departure from Costa Rica was not until noon on Saturday, I decided it was risky to make the 3-hour drive from Monteverde to the airport on Saturday morning itself. There are few roads from Monteverde, all dirt, and only one that is realistically passable. (On our trip in 2004 we took a back road down from Monteverde and it was an unbelievably hairy trip.) Any sort of snag or snafu could happen to the road or the vehicle. So we called up Sergio and scheduled a return taxi for Friday afternoon. That left just the morning to capture one last exploration of Monteverde. Kathy had also won – at the Friends School fundraising auction – a horseback-riding tour for two. So Pam, Mara and John headed off with Jim and Laurie and their two girls for a horseback outing through the pastural hills on the west side of Santa Elena, while Andy and I walked back to Bajo del Tigre in hopes that we might visit those trails again, this time in the daylight. It was another beautiful sunny day, and we had kilometers of trail all to ourselves. We followed the numbered self-guided nature trail, with the guidebook explaining the plant and animal life, history, and ecology of this non-profit forest reserve originally founded by Swedish schoolchildren (really!). 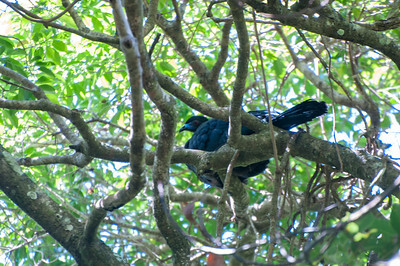 Andy’s good eyes spotted a pair of black guan, huge turkey-sized birds up in the canopy. Our final Monteverde meal (thanks Laurie!) was beans and rice and fresh salad, wonderful with the Costa Rican Lizano salsa that makes everything taste good – meant the end of a fantastic few days at Casa Hooke and with the our newfound friends, aka Jim & Laurie and their daughters. After a few fond farewells we were off again with Sergio, this time to be guided by his son Ricardo. There was a delay because the main road out this direction was being re-graded, and a couple of hours later another delay because the coastal highway was in use for a women’s bicycle race (circumnavigating Costa Rica). These are the kind of unexpected delays that triggered my instinct to move us close to the airport a day early. We arrived in Alajuela, a small city next to the San Jose airport, about an hour before sunset, and quickly headed out to explore. The central park was only two blocks from the hotel, and was bustling with people relaxing on this late Friday afternoon. Next to the square was a large Catholic church, preparing for Friday mass. Just down the road was the central market, a large indoor series of stalls selling everything from meat and fish to vegetables and herbal remedies to cell-phone accessories. I always feel these markets are a great place to get a sense of the local culture. This one was busy with customers on their way home from work, buying the necessities for a weekend with family. As the sun set, the market and most other shops started closing, rattling their heavy-duty gates into place. Even our hotel had such a gate across the entrance at all times, making me a bit uneasy about the nature of this town after dark. We found a friendly Tex-mex restaurant nearby and settled in for chimichanga and nachos. Overall, it was a great week. Costa Rica is a beautiful place filled with friendly people. We learned a little about a tropical ecosystem, sustainable farming, chocolate production, and a different culture; we spent time with old friends and made new friends; we got sunburned and ate good food; and we had a lot of fun. See all three photo galleries. 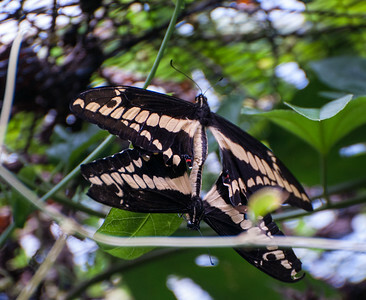 two mating “thoas swallowtail” butterflies. Thursday was our last full day in Monteverde, and we set off for the Monteverde Butterfly Garden. (We considered heading to a fancy new facility outside town, which offered a bigger butterfly garden as well as ziplines and suspension bridges among the forest canopy, and other attractions, but it was outlandishly expensive.) With no transportation readily available, we walked the dirt road toward town and down a long side-road to the Monteverde Butterfly Garden – the original, I believe, which came strongly recommended by the locals. There we met with a young intern from Denmark who had taken a six-week internship as a volunteer tour guide in return for room and board. 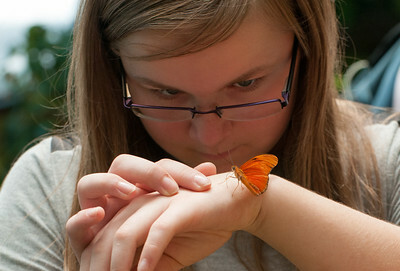 She said she was studying toward a biology degree, and her love of insects and arthropods was infectious. She first gave us a tour of the spiders and beetles and stick bugs and other fascinating creatures inhabiting the indoor terraria, before leading us through a series of four butterfly gardens. Each represents a different Costa Rican biome, with a range of different butterflies. I pulled out my big lens and tried to capture some images of these beautiful creatures. The tour wrapped up with an exhibit of a functioning colony of leaf-cutter ants. Cool! the kids loved that. For more photos, check out the nature gallery and start on page 4. We walked into town in search of lunch and groceries. 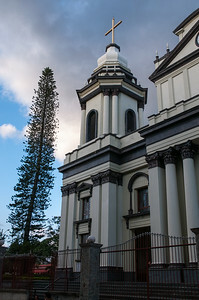 The town of Santa Elena is small – perhaps four or five blocks in the commercial district. Riddled with touristy shops, we stopped into the colorfully painted Morphos restaurant for lunch. The blue morpho is perhaps the most famous of Costa Rica butterflies, with an electric blue color tantalizing all photographers; its image was painted on every wall. The food was pricy and yet unremarkable, as one might expect in a touristy town :-(. The day was capped by another beautiful sunset and a wonderful dinner of beans & rice for 11 back at Casa Hooke. Interior of the new Kinder building. As I mentioned in an earlier post, our friend Kathy is teaching at the Monteverde Friends School. 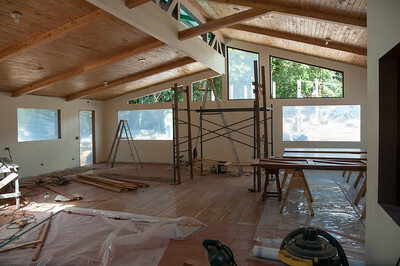 Her husband David has designed and is building a new timber-frame meeting house (check out the project’s Facebook page). The school was founded by the Quaker community and the current meeting house, which serves the whole community, has been outgrown. It is a complex project, because the new meeting house will sit on the footprint of the kindergarten building; and the new Kinder building is still under construction. Indeed, the goal is to have the old Kinder demolished (by hand!) and the new Kinder open for business, by next Tuesday! 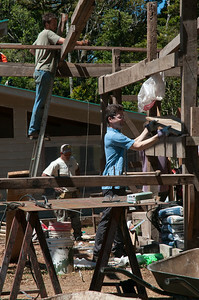 David helps to disassemble the bodega. When we arrived at the job site the new Kinder was abuzz with activity; a mixture of the contractors’ staff and volunteers were painting the interior and completing a retaining wall next to the structure. Our family and Jim’s family spent much of the day helping with today’s big task: disassembling the bodega (a storage shed for construction materials) so it can be moved to a new site, away from the new Kinder and closer to the new meeting house. Further, to clean up the construction debris from the area around the Kinder; imagine the challenge of removing every dropped nail and scrap of wood from the area where kindergartners will soon play. Our kids did a wonderful job, working hard to pick up debris and sort it into piles suitable for recycling, and were soon recruited for ferrying loads of soil to backfill the new retaining wall. There was a mid-morning break for Meeting, in which all of the K-12 schoolchildren, plus teachers and staff, elders of the Quaker community, and guests, sat quietly for an hour. After about 20 minutes of silent contemplation – quite impressive for the young schoolchildren – one of the teachers spoke (first in Spanish, then in English) about an inspirational quote from Chief Seattle. We sat for another period of silent contemplation. I thought perhaps another person would be moved to speak, but eventually the head of school stood to invite the guests to introduce ourselves, then shared some school announcements before dismissing the Meeting. The kids clean around the bodega while Jim removes the roof. 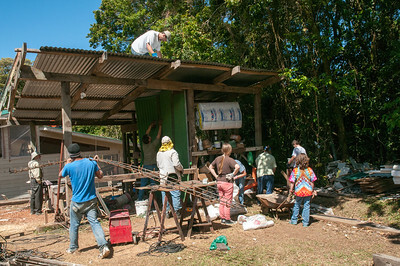 We returned to the hard work – the bodega was built with heavy tropical timbers – yet the work was made pleasant by good weather and good friends. One of the other volunteers in the bodega crew was David, who I learned is the son of Ricardo (our guide from the cloud forest). David had been a student at the school until recently and was home from university for a break. Nice fellow! Our team was tuckered out, and headed home mid-afternoon for a good rest. 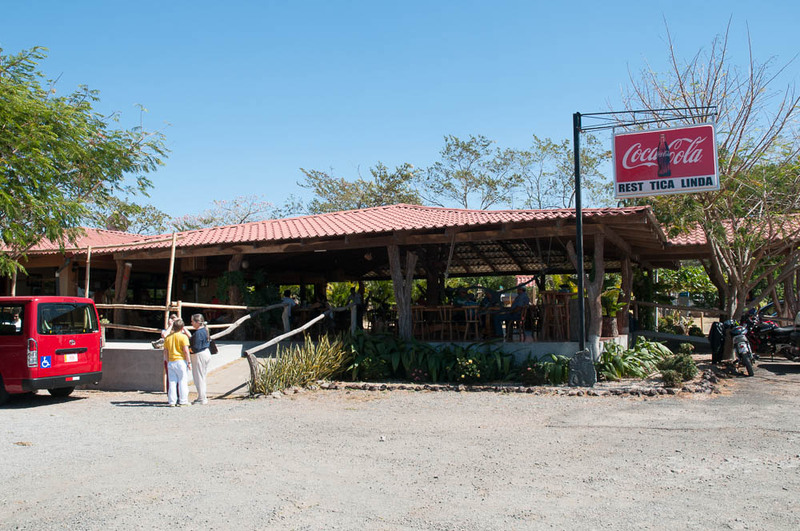 John was excited to babysit for the other five kids, who recruited them all to prepare a dinner of fried rice, so we adults walked down the road to Café Caburé for a fine meal of food inspired by both Argentinian and Costa Rican traditions. Concluded, of course, by fabulous chocolate desserts! For more photos from the Friends School, view this gallery (start on page 3). 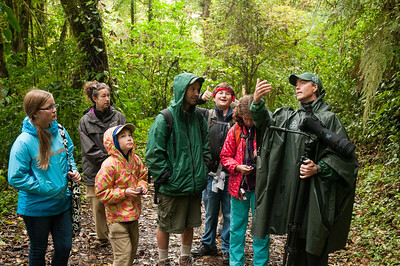 In Monteverde, the Main Event is always a visit to the Monteverde Cloud Forest Reserve. This astonishing place is home to a high-altitude tropical rainforest, well, actually, cloud forest. The forest along the high ridge that forms the continental divide in Costa Rica is almost perpetually bathed in cloud, and all that moisture supports a verdant ecosystem of plants and insects and animals. (The very name monte verde means green mountain in Spanish, well-noted by our friends from Vermont, which of course derives from the French vert mont.) At this time of year, the stiff trade winds blow off the Caribbean sea and over the tropical lowlands of eastern Costa Rica; when they rise to this ridge at 1500m they cool and clouds form. Almost immediately they evaporate within a kilometer of the ridge, so the village of Santa Elena (where all the people live) is nearly always sunny. 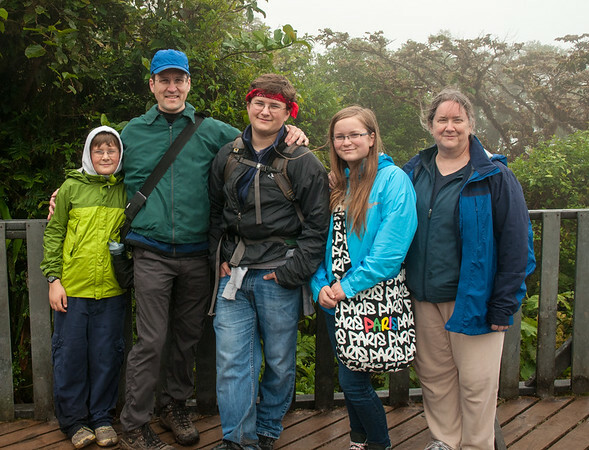 We were chilly and damp in the cloud forest, then later warm and sunburned down at the house. Richard Guindon, at right, was our guide for the day. We caught the morning bus as it passed by the Cheese Factory near the Hooke residence. This being a school day, the bus was packed with children riding up the mountain from town to the Monteverde Friends School (more on that in the next blog post). We walked through the forest for about two hours, stopping frequently while our guide, Ricardo Guindon, told us about the plants, insects, animals, and forest ecosystem, as well as the history of the reserve. This area was largely unsettled before 1950, when a group of Quakers left the U.S. to found a new community in peace-loving Costa Rica. They built dairy farms throughout the town that is now Santa Elena. 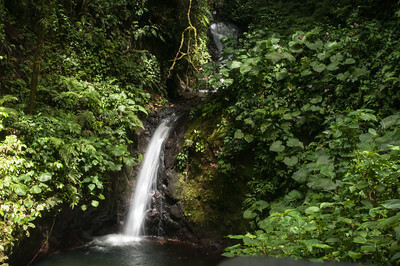 They recognized the importance of the cloud forest as a source of water, and conserved many pristine areas in the watershed. George Powell, a biologist, recognized the biodiversity value of this region and, working with a local man Wilford Guindon, formed a non-profit and began to acquire land that forms this reserve. Our guide Ricardo is Wilford’s son, and told many stories about his childhood play in the forest, and driving cattle along the trails to the pasture on the eastern slopes. After childhood, he has been leading forest tours for nearly 20 years and is encyclopedic in his knowledge of the place. Andy and Mara face into the trade winds. It was chilly and misty, with clouds condensing on the canopy overhead; thus we walked through a steady dripping drizzle all morning. We reached the far side of the reserve, at La Ventana (the window), a platform on a narrow section of the ridge – the continental divide! – that on a clear day allows you to see the Caribbean Sea to the east and the Pacific Ocean to the west. 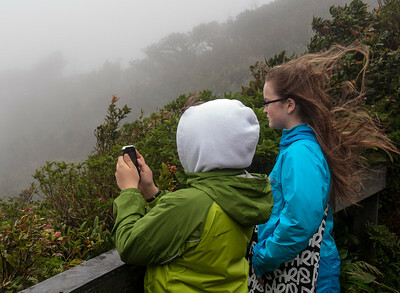 This being the cloud forest, of course, it is almost never clear. The kids found the stiff breeze of the trade winds to be exhilarating. Family photo at La Ventana, along the continental divide. 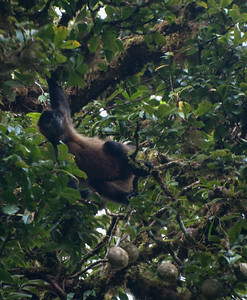 A spider monkey in the canopy. On the way back out we were excited to see Spider Monkeys browsing fruits high in the canopy, and a toucanette bird close enough to see really well. Curiously, the spider monkeys have evolved to lose their thumbs, but have prehensile tails that make them very agile in the treetops. 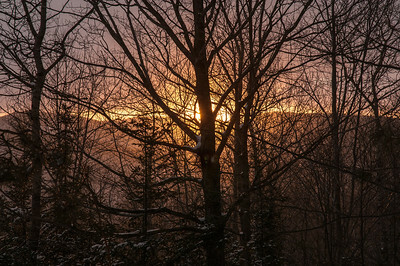 The sun broke through, as the warming day started to evaporate the clouds closer to the ridgeline. We enjoyed lunch at a picnic table next to a hummingbird feeder, with its gloriously colorful visitors. I took many dozen photos and got just a few keepers. The violet sabrewing was our favorite. Waterfall in the cloud forest. After lunch most of us walked back into the forest to visit this stunning two-level waterfall. Along the way we spotted a hummingbird in its nest alongside the trail, and at the same spot, we watched a pair of spotted woodcreepers building a nest right above the trail. 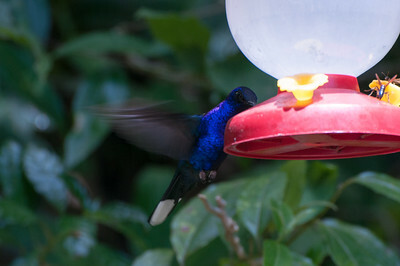 For the photos, see the Monteverde nature gallery, starting on page 2. 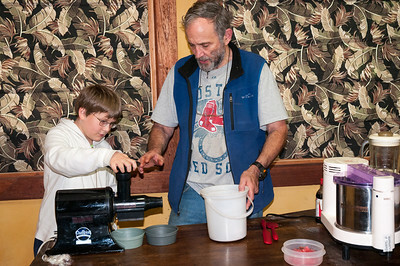 Andy helps Chocolate Bob to grind the roasted cocoa beans. Late afternoon we went to the Chocolate Tour at Café Caburé, close to the Hooke residence. “Chocolate Bob” is a Massachussetts native and former biologist, who lives here with his Argentinian wife. She runs the restaurant (café) and makes wonderful chocolate desserts. He took up chocolate making, and gave us a fascinating tour of how it works. Starting with the cocoa beans, which he buys after they are fermented at the farm, he demonstrated all the steps in producing chocolate. The kids got to help and we all had opportunities to taste it at various stages. Wonderful! For the photos, see the Monteverde other gallery, starting on page 3. 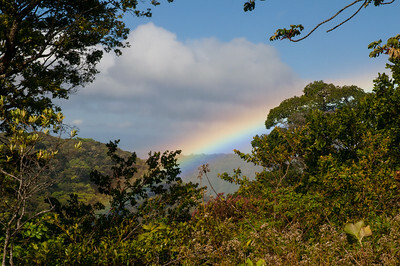 We awoke Monday to a sunny day and a bright colorful rainbow, after a heavy rain overnight. Rain is unusual – this is the dry season – but very welcome because there was little rain during the wet season. Our main goal for the morning was a tour of a coffee plantation, which Kathy won as part of a fundraising auction at the Friends school. Kathy and Benjamin had the day off school, so she joined us and the DiCarlo family for the tour. 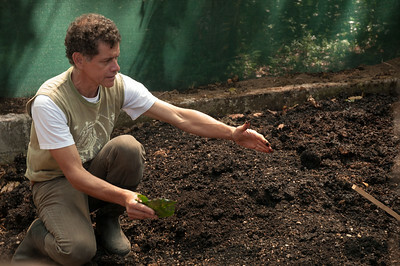 Guillermo explains how they compost coffee husks. Guillermo, one of several brothers who returned to Monteverde to take over the family farm after pursuing education and other careers, walked us through the plantation and explained its many sustainable organic practices. We learned a bit about how coffee is grown, and a lot about sustainable farming. The family grows its own vegetables and bananas, and keeps chickens, quail, pigs, and goats for eggs, meat, and milk. The coffee husks are composted (by earthworms) to fertilize the fields, and the animal manure is pumped into a biodigester that extracts the methane gas and pumps it to the kitchen for cooking. The kids had a wonderful time exploring the fields, petting the animals, and climbing in a beautiful tree. The tour ended with a lunch prepared by the staff, from their own produce (Mara skipped the main dish when it became understood that it included one of the chickens we had met earlier :-). After shopping in town for groceries and souvenirs, we headed back to the casita for a little rest and a quick dinner before sunset. It turns out that the Hookes live right next door to Bajo del Tigre, a beautiful section of the Children’s Eternal Rain Forest. 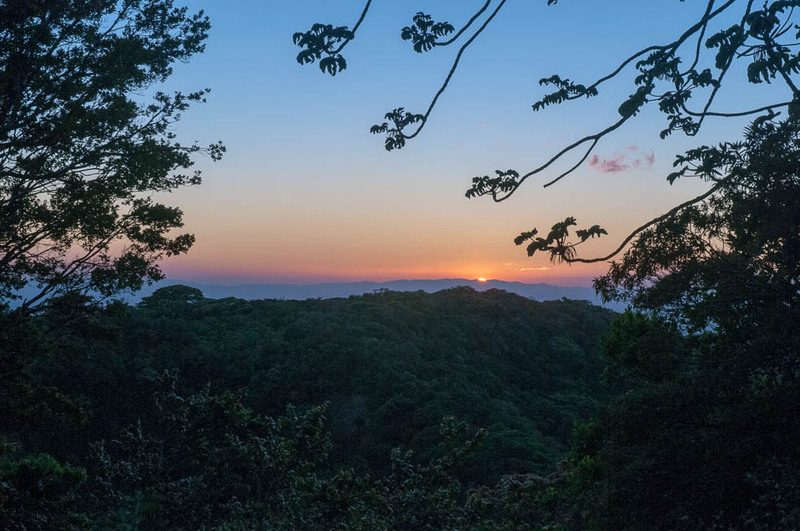 Many creatures are active only at night, so night hikes are a popular attraction in Monteverde. As the sun set, we obtained a guide and prepared to follow the trails into the darkness. He gave us stern warnings not to wander off the trail, or to touch the vegetation, and always to allow him to go first, lest you meet one of the local snakes. Kids love hiking in the dark, of course. The guide had good eyes, and found two sleeping birds – a toucanette and a motmot. Each bright green bird was clinging to a low branch, almost within reach, gripping the branch tightly as it swayed in the persistent Monteverde wind. Astonishingly, the birds were asleep! and did not even notice us. The highlight of the tour, however, was certainly the tarantula shown above. 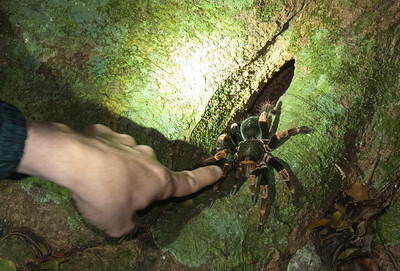 The guide knew of a tarantula nest – a small crevice at the base of a tree – and gently coaxed the tarantula out for us to see. Wow. For more photos, visit the Monteverde nature and other galleries. As the van bounced along the dirt road leading up into the central mountains of Costa Rica, leaving a dusty cloud behind to settle on every roadside home, we started to get spectacular views across the brown hills of the dry season. We were headed toward the high hills of Monteverde, along the continental divide far above the tropical lowlands and the bustling city of San Jose. Our dear friends Kathy and David are living there for the year; Kathy is on sabbatical and is teaching at the Monteverde Friends School, where their son is in second grade. David, who runs a timber-framing business at their home in Vermont, was roped into building a new Meeting House for the school and its Quaker community. We were thrilled to have a chance to visit this beautiful country during the kids’ school break, and grateful to Kathy and David for allowing us to share their hillside home for a week. We arrived in late afternoon at Kathy and David’s rented home, where we were also greeted by another Dartmouth family (Jim and Laurie and their two daughters), who are also passing through during their sabbatical year. They all share the main ‘casa’; we are snuggled into the detached cottage (‘casita’). Both have a beautiful sunset view (below). A huge feast of casado (rice & beans) with sausage and vegies, with seating for 12, rounded out a long but enjoyable day. A full week of exploring yet to come! Instant frostbite! That was my concern as we stepped out of the car on Saturday afternoon, stuck in deep snow at the unplowed parking area for the Appalachian Trail on the southwest slopes of Mount Moosilauke. The snows of Winter Storm Nemo had just ended, and were drifting deeply in strong cold winds that followed the storm. Although the New England coast had been hammered by this blizzard, at home in Lyme we received only 6 inches of snow and up here we found perhaps 8–10 inches. Not much, but very welcome replacement for the icy trails and bare brown fields that were here a few days ago. By the time I had dug out a parking space and gotten the skis off the roof of the car, my fingers were numb and the kids were complaining about the cold. We strapped on our skis, hoisted our packs, and skied up the trail toward Moosilauke. 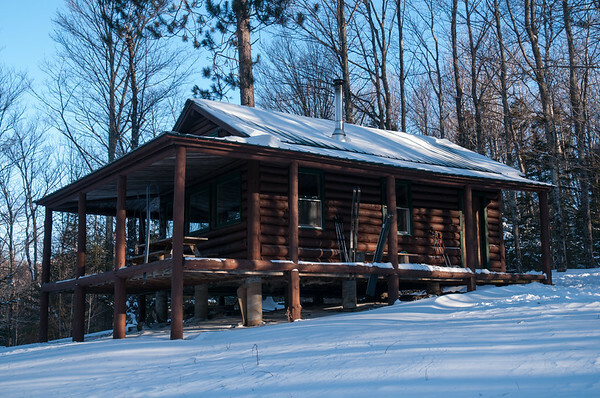 Fortunately it is not far to Great Bear cabin – perhaps half a mile – and the fresh snow had been tracked earlier in the day by some snowshoers. We reached the cabin after skiing across windswept meadows, and were pleased to find that it was still warm from the prior occupants. Mara quickly had a roaring fire going, while the boys cracked the ice on the stream to bring back a pot of water. We settled in for a warm and cozy evening as the sky cleared, the sun set behind the trees, and the temperatures dropped below zero. We played a few rounds of various card games, enjoyed a wonderful pasta dinner, and roasted in the sleeping loft as the wood stove cranked away all night. The next morning was lazy as we cooked breakfast, cleaned the cabin, and got ourselves out at the crack of noon. By then it had warmed up into the teens or maybe twenties, with a brilliant blue sky and sunshine, so we took a nice ski tour through the meadows and woods before heading home. We passed numerous hikers who were returning from the summit, who all reported spectacularly clear views and a stiff windchill up there. I was jealous. A wonderful if brief weekend! Here are some more photos from that trip and also a walk we took near home on the weekend before.